Sophie says..: Review: 'I love...Juiced up blackcurrent' bubble bath & shower creme! 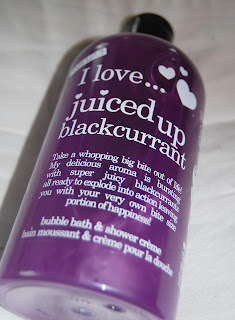 Review: 'I love...Juiced up blackcurrent' bubble bath & shower creme! I love... Cosmetics are a budget brand of fruit fragranced products that range from bubble bath to scented candles. Since their creation in 2008, I love... are internationally renowned for their delicious scents and bright colours that aim to "generate a pure feel good factor and a sense of pure happiness". That is precisely why I was so excited to try their newest addition: Limited Edition I love...juiced up blackcurrant bubble bath & shower creme. I cannot get enough of this packaging. The bottle is a gorgeous shape, and the transparency shows off a luxurious purple colour. It's simple, concise and I love the description! As I have said before, I love... products are reasonably inexpensive and this limited edition bottle is no exception. You can buy 500ml for only £2.05 - What a bargain! What I think is great about this product is that it is both a bubble bath and shower creme, so there's even more value for money! As i've had a pretty hectic schedule lately, I decided to try it out as a shower creme. I found that I only needed a small amount, and lathered up extremely easily when using a shower puff. Literally as soon as I opened the bottle I was hit with a sweet smelling scent of blackcurrent's (Which is as close to fruit as i've been for a long time due to my student shopping budget!) and got out of the shower smelling like a Rowntree's Fruit Pastille! If you're like me and a sucker for something with a strong scent, this is definitely for you. It's excellent value for the amount .. my mouths watering just thinking about it! A must buy for anyone who wants their day brightened as soon as they step into the shower - and it looks great on your bathroom shelf!